Please refer to our stock # jm1 when inquiring. These great statement earrings were designed by San Francisco based designer jeweler, Jan Michaels. Each clip earring is 4" long x 2 1/2" in diameter at the hoop. 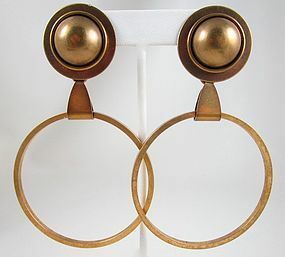 They are made from brass with Jan's signature "antiqued" finish which gives the earrings a wonderful mellow tone. They have clip back mechanisms and are signed "Jan Michaels San Francisco" on the reverse.